The Artist’s Way, by Julia Cameron: For anyone doing any kind of writing, or any kind of art, this is a go-to for kick-starting your creativity. It’s a practical, step-by-step process full of nutty self-helpy stuff that I just tune out. I resist what Tom Bissell once brilliantly called “tea and angels writing” — you know, workshops about finding yourself through writing and that sort of thing — and this book has a lot of that silly ’90s self-help language in spades. But underneath is an effective plan for getting your creative juices flowing. I’ve done it at least five times throughout my adulthood. Storycraft, by Jack Hart: Helps with the hardest parts of nonfiction — making real life into great stories, while still telling the absolute truth. Telling True Stories, by Mark Kramer: Covers journalism as well as book-length nonfiction, through written pieces by and interviews with writers and editors. Bird by Bird, by Anne Lamott: A classic. Great inspiration to just keep going with your work — even, especially, when you’re feeling despondent or overwhelmed. Launching Your Blog: Class Coming Soon! I always love to share good writing resources. I love to read I read everyday. I love the way books but you in their world. I have “the “Artist’s Way” in a box in my garage somewhere. A friend gave it to me about 15 years ago and I still have the notebook somewhere I started writing in out there, too. Maybe now since I am actually writing a book now, 2 chapter links can be found on the opening page at http://mynameisjamie.net .I have 4 completed chapters and about 3 partials started. It took 8 years of research and gathering info to get to the point of being able to write it. The blog is a way to get different issues categorized. It feels so right now. I’m glad I found you! Ill be back to read more, absolutely. Another wonderful one is “On Writing: A Memoir of the Craft” by Stephen King. I’m with you too! I read it over a decade ago but I still remember points from it sometimes. I love Stephen King, and absolutely need to check this out. Thanks for the recommendation! I’m still on the Bukowski’s side. Or you have it or you don’t. Don’t force yourself into becoming a writer, if you don’t have guts. Many people believe it to be a great experience to write something, but they are just dodging the truth that their writing will never have any value. My advice for them would be to focus on some topic they love, say cooking, but in great detail. Blogs are great in this sense. I don’t say that it’s better not to write, I just don’t believe in writing as a learnt process. Julio Cortazar wrote his first book when he was eight, and became one of the most important writers from Latin America in the 20th century. How many people who tried to go to the writing schools can claim something similar? A few months ago, I discovered “Writing is My Drink” by Theo Pauline Nestor. Loved it! BTW: Can anyone tell me how to create a hyperlink in a comment/reply? Reblogged this on Grace Graunke. There are some good books here. The Artists Way and Bird by Bird are both books that have been continually recommended over many years and I now dip in and out of. Good information. I loved Bird by Bird. I also found Judith Barrington’s Writing the Memoir extremely instructive, useful and fun to read. I had written several drafts of my memoir but after reading the book I felt Tales From the Family Crypt came together as a real, cohesive and compelling yet funny story and much less of a rant about our dysfunctional family. If you’re writing a memoir, check it out. It’s a quick read and well worth your time. Thank you for the new resources! I will have to add the Artist’s Edit to my list of references. Or The Artful Edit, I should say. Ah, the benefit of an aging brain! From the time I read the post to the time I scrolled down to comment, I completely re-wrote the name in my mind! Reblogged this on Life is an Adventure. This is a useful source of writing instruction :). Thanks for your article! Writing Down the Bones by Natalie Goldberg has been a gem in my life. Must reads for the evolving writer. I all in! This is very informative. Great post great books! List of books on writing well! Great list — thank you! Pingback: My Favorite Books About Writing Nonfiction | C. Green & Associates, Inc.
For those of you who read about writing, I think Jennifer Keishin Armstrong has some good tips. Please comment if you have other favorites to share. This is a great way to help people find their inner writing self. I’m going to have to look into some of these books! Reblogged this on fliercrew2014's Blog. A few good ones for every writer to check out! I love reading! Great post! Lovely post. Over the years that I have been writing, one thing that has stuck with me is: Read books: Gain knowledge. I will check these books out and share with my writing friends. I stumbled upon this via Freshly Pressed and just had to share. Creative nonfiction and memoir are hot right now, I’m actually editing a memoir for a local writer right now. If you write creative nonfiction/memoir (even as a blog) you should check out this list. Reblogged this excellent list of nonfiction resources. Thanks for the post! Self editing is the most challenging aspect of my writing. My novel, Almost Human, comes out this spring (2015) and I have to say I struggled more with the editing than writing the book! I certainly plan to read this book. Reblogged this on The "Professor of Bishop". Reblogged this on How To Make Money Online Fast. Such a brilliant read. Thanks for curating this list and sharing it here on your blog. Thanks for this! As a professional editor, I’m always looking for good resources. A long-time favorite of mine is William Zinsser’s “On Writing Well,” but I’ll be sure to check these out as well. That one is great, too. I’ve had it since they made us buy it in college! Nice! For me, it was a creative writing class in high school. Several editions ago! I love to read everyday I can read just about anything. I will certaintly be checking one out! I love to read books on the craft of writing and I love this list. Stumbled “accidentally” upon The Artist’s Way a few years ago in the book collection of my sister. I was on a visit to Philadelphia then and got so hooked that by the time I returned home I had a collection of Morning Pages. It was this ritual of writing that eventually led to my blog. Yes, we writers love to read and reading about writing makes me read more and, relatively, write less! I will definitely read the others recommended by you. I have also read Bird by Bird. Thanks for the list. Thank you for the list! I’ve read Bird by Bird, but the others are all going on my list! Thank you for the recommendation, Jennifer. 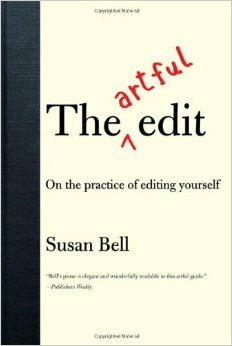 I’ll get myself a copy of The Artful Edit. Another writers help book I adore is How Not to Write a Novel by Mittelmark & Newman. Insightful and hilarious!